The World at Your Desk. When you need expedited service IBC’s Next Flight Out (NFO) service is your solution. Providing solutions worldwide, IBC can pick up anywhere, anytime and get your shipment on the next possible flight to its destination. Offering Same-Day and Time-Definitive Delivery, our premium products are designed to meet the toughest of deadlines. Just call 888 SHIP IBC or +1 718-526-5300 and we will pick your package up within one hour. Our special service representatives will schedule your shipment right away and find the best possible route to destination. IBC maintains the Chain of Custody thru to destination and offers tracking for each step of the way. Ensures the special handling required at destination to secure first delivery of a shipment. Priority One services encompass a 24/7 time-definitive delivery to next-flight-out performance. Desk-to-desk delivery of documents and small packages worldwide within 24 to 72 hours. Time-efficient handling service for individual shipments that do not require confirmation of delivery and whose delivery time is flexible. An amalgamated product that incorporates a combination of mail options custom-designed to suit your individual needs. Working with foreign postal authorities with offices in the United States, IBC applies foreign postage before routing the mail on direct flights to destination countries. Provides one-stop shopping for direct marketers of catalogs, brochures, and directories who wish to effectively reach the growing customer base in Latin America and the Caribbean. A complete menu of services is available, including warehousing, delivery, list management, database management, fulfillment, call center management, business reply cards, reports, and project management. Assistance with folding, address labeling, inserts, sealing envelopes, and shrink-wrapping is just a phone call away. IBC's technical staff is available to fulfill your requirements by eliminating duplications, merging and purging records, and data and address correction. IBC can manage and receive address files in various formats, including magnetic tape, diskette, and file transfer via the Internet. Please contact your local IBC representative for more information or to discuss any specific requirements. Many international destinations often mandate that mail be completely enclosed in order to avoid being classified as "trap mail." IBC offers packaging that, in addition to meeting with postal guidelines, enhances its appearance. As part of IBC's full service offering, we can place address labels or inkjet recipient addresses on to mail pieces based on customer provided lists. Unparalleled flexibility — with custom-designed services for complete control. IBC specializes in time critical, hand-carry, personalized courier services with just one responsibility — catering exclusively to the needs of your special shipment. These shipments are accompanied by a dedicated passenger provided by the IBC. The IBC OBC team operates 24/7 for the most reliable and prompt reaction time. Our on-board carrier maintains the chain of custody from drop off to pick up, offering safe and prompt delivery of your shipments. We can pick up your shipment anywhere, anytime within one hour of your call for the most expedited service. IBC’s expert specials staff are experienced in acquiring the best offer regarding the airline ticket considering that passenger is travelling using the lowest available rate that fits your timeframe. Trusted by some of the world’s top fashion leaders, law firms, Fortune 500 companies and more, IBC is a leader in specialty OBC, hand carry services. Makes all cargo and combination planes available on demand and under contract for single-day or long-term use. Designed for manufacturers and distributors of critical parts, service options include breakbulk, assemblage, consolidation, order entry, pick-n-pack, distribution, inventory control, and customer support and service. Order management, distribution functions, warehousing, and information management services all unified and available in one place — allowing you to concentrate on what you do best. Special handling for Dangerous Goods, Restricted Articles, and even Hazardous Materials. Contact Us to arrange a special shipment today! Urgent documents and small packages always need to be somewhere important, very far away, yesterday. We put our expertise in dealing with each country's customs, regulations, and practices to use every single day. This means that your time-sensitive items are received promptly, consistently, and cost-effectively. When normal express transit times won't do, IBC offers you the flexibility that gets your deliveries made and helps you meet even the toughest deadlines. We'll work with you to determine speed and budget, and strike the most efficient balance possible. 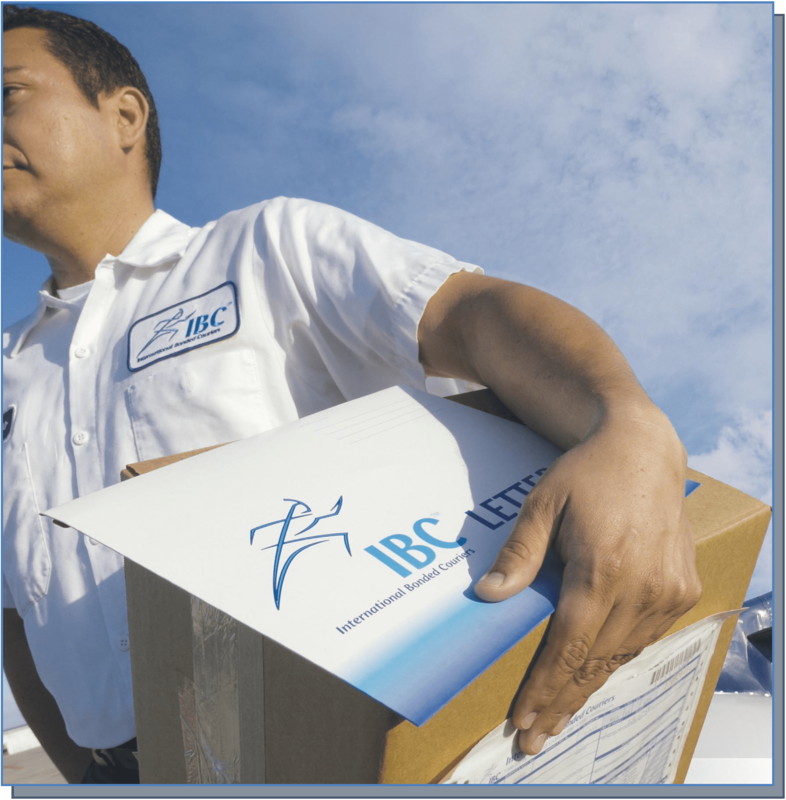 Contact a representative for help determining the IBC Courier service that's right for your business.